The saffron party will use Lord Ayyappa the same way it made use of Lord Ram in the north to take away the Nair vote and make electoral inroads in the state, observes Shine Jacob. Sabarimala is considered one of the largest pilgrimage centres in the world, attracting more than 20 million people a year. However, what grabbed the headlines recently were a Supreme Court order that allowed the entry of women in the age group of 10-50 to the temple, built before the 12th century, and the protests by organisations and political parties led by the Bharatiya Janata Party. While protests are at their peak, with even women journalists being manhandled, many believe this may well set the stage for the BJP’s electoral triumph in Kerala, where the party couldn’t mark its presence for decades, despite having one of the strongest bases of the Rashtriya Swayamsevak Sangh. According to reports, the RSS has the maximum number of shakhas -- of more than 5,000 per day -- in Kerala, taking into account all its “prants” (regions), much higher than the 1,000 per day in Prime Minister Narendra Modi’s home turf, Gujarat. 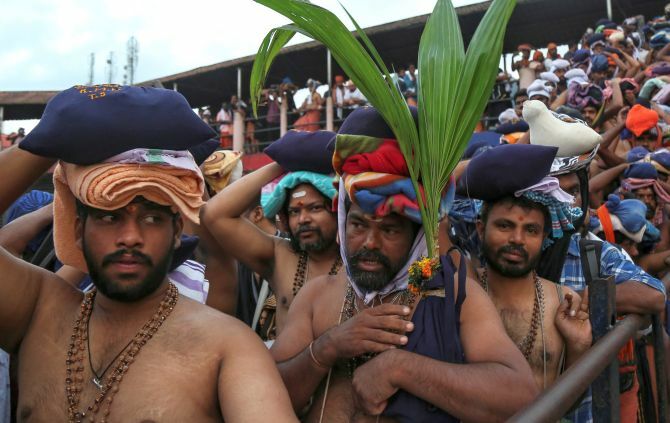 It was through a judgment in 1991 that the Kerala high court restricted the entry of women of the age group 10-50 to the Sabarimala shrine because they were of the menstruating age. One of the major issues cited then was the celibate status of the deity Lord Ayyappa. Interestingly, the case was then triggered by the shooting of a Tamil film called Nambinor Keduvathillai, in which four young actresses were allegedly made to dance in sacred pathinettam padi (18 steps), according to a report by manoramaonline. A local court had then imposed fines on the actresses and also the Devaswom Board (governing the temples in Kerala) for allowing permission to shoot. Despite having the advantage of being an RSS stronghold for decades, the BJP failed to make electoral inroads into this southern state. Political analysts say the protests at Sabarimala may well be opening the door for the party, which had been struggling to find an issue to give them political leverage in the state. This comes after “almost a failed” attempt by the party to launch a national campaign on the political murders in Kannur -- in which both the Communist Party of India-Marxist and the BJP are to be blamed equally. “After the failure of the Kannur campaign, the party is trying to use Lord Ayyappa in south India in the same way it made use of Lord Ram in the north. It may be successful this time, especially in taking away a good share of Nair votes,” said B R P Bhaskar, a political analyst. According to the official data, around 21 per cent of Kerala’s population are the Ezhavas, while the Nairs account for 12 per cent. An ally of the BJP, the Bharat Dharma Jana Sena, floated by Vellapally Nateshan of the Sree Narayana Dharama Paripalana Yogam (a body of Ezhavas), was instrumental in increasing the BJP’s vote share from a mere 6.1 per cent in 2011 to 15.3 per cent in the assembly elections in 2016. Many political analysts say the current issue may attract more upper-caste and Nair votes, traditionally shared equally between the Congress and the Left parties, towards the BJP. The BJP has more than 800 gram panchayat members, close to 240 municipal members, 51 corporation councillors, 28 block panchayat members and three district panchayat members in Kerala. “There is no political motive for the BJP in these protests. Other organisations started them. The state government should have blocked such a war-like situation, which is hurting public sentiments,” said B Gopalakrishnan, the state spokesperson for the BJP. He added after the judgment, the state should have filed an affidavit to maintain the status quo until the review petition was heard or could have come up with an ordinance. “One has to take into account that even the Devaswom Board has upper-caste superiority, with the Nair community, Thantri family and the Pandalam Royals. So far, the BJP failed to make inroads into Kerala owing to the renaissance thoughts in the last two centuries, which were not divisive,” Bhaskar said, adding that the trend has changed, and that could kindle the BJP’s hopes in making inroads into south India.